When people are discussing various methods of medicine to cure their ailments, essential oils is not one that comes up very often. However, the use of essential oils has steadily been rising in popularity as their medical benefits become more widely known. 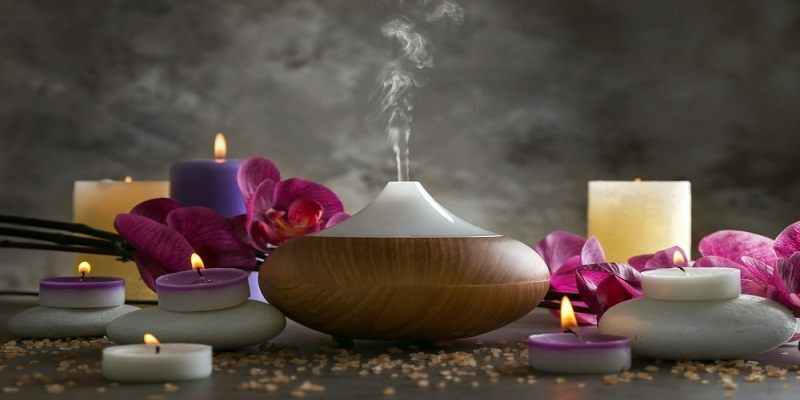 Many people have now been adding essential oils to diffusers, so the scent can be enjoyed throughout the room. But can you also put essential oils in a humidifier? The short answer: doing this is not a good idea. There are a few key reasons for this, which we will break down in the article below! The first important point to understand is how essential oils are traditionally dispersed through the air. Diffusers are typically the item of choice in regards to these oils. Diffusers combines water and oil to form a sort of mist. This mist is then dispersed into the air, so that the people in the home can feel and smell the oils. As a result, people will be able to use the oils to relieve their breathing and sinus issues, and help them battle basic illnesses such as colds. Basically, diffusers are made for the purpose of using essential oils in them. In comparison to this, let’s take a look at how humidifiers work. Humidifiers have the purpose of restoring humidity into the air of a home. A lack of humidity can cause irritation to the skin, eyes and other areas of the body. Dry air can also result in cracks in the house, such as in the drywall and plaster. Therefore, dry air is definitely not a desirable thing to have in a house, so it is a good idea to have a humidifier for solving this. However, this does not mean that a humidifier can work for everything that you desire. Here are some reasons why humidifiers should not be used to diffuse essential oils into the air. The way that humidifiers work is that they collect the excess heat in the room and release it into the air in the form of vapor. If essential oils are dispersed using heat, this will reduce their effect. The oils will become more diluted, and they will not benefit you as they should be doing. This means that the various health benefits of using essential oils will do little to no good to you. This can be frustrating, especially when all you were trying to do in the first place was be healthier and happier inside your home. The exception to this is if you specifically have a cold air humidifier. These types of machines work very similarly to a diffuser. Most humidifiers are made from using a lot of plastic materials. This type of material is not designed to withstand essential oils. The oils contain elements that will eventually break down plastics, and will therefore cause issues with your humidifier. Humidifiers are meant to handle water, and little else. As well, the essential oils will actually start to clog various parts inside the humidifier. Eventually, it will slow down and stop functioning effectively. As a result, the water tank will usually crack and break. Once the water tank and other areas of the humidifier start to leak, the unit may not be salvageable anymore. You cannot use a cracked humidifier, because it would not be helpful in reducing the level of humidity in your home, and instead would add to your list of problems. Seeing as diffusers are actually meant for the task of dispersing essential oils, they are more equipped to do so. For example, diffusers are able to reduce essential oils until they are just a fine mist. The particles are so small that they are able to mix with the air and be released into the house. This is good because people are able to simply breathe in the mixture that has been created. It is also easier to be absorbed into peoples’ bodies. Humidifiers on the other hand, are not able to break up the essential oils into such a fine mist. This means that less of the oil will be absorbed and used to benefit the people in the home. 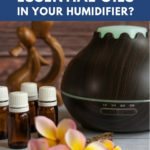 If you are interested in using a humidifier for your essential oils simply because you do not want to buy a diffuser, you may think that you are saving yourself extra steps. However, you should not try to take shortcuts on certain things, and this is one of them. When you put essential oils in your humidifier, you may create an odd mixture of oil that is sticky and heavy. When this is expelled from the humidifier, it will land on your furniture, clothes and your body. This is very unhygienic, and can leave you feeling frustrated. This type of oil mixture is very difficult to clean, so you will be fighting with it for a while to come. So to conclude, research points to the answer that humidifiers are usually not meant to be used in conjunction with essential oils. There are certain exceptions, such as if you specifically have a cool mist humidifier that was designed to be doing such work. Overall though, you would be better off investing in a diffuser for your essential oils. Have you tried a certain brand already? Let us know your experience in the comments below, and don’t forget to share this with your friends so they will be prepared as well!